At first, I thought that Winslow's quip was all wrong, reducing gloriously detailed counterpoint to flat and monotonous wall hangings. But a bit of research into wallpaper patterns or groups quickly demonstrates that wallpaper is much more than Muzac for tired eyes. 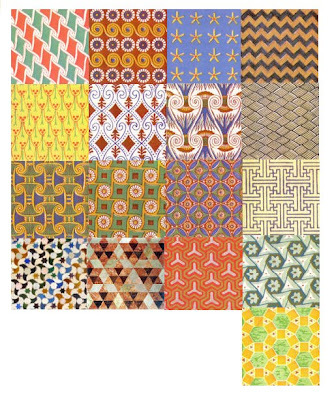 There are 17 possible wallpaper groups, which are two dimensional repetitive patterns. Wallpaper groups are more complex than frieze groups (which repeat in only one dimension) and less complex than three-dimensional crystallographic or space groups. The groups are classified according to their symmetries, and once you understand the symmetries, even the most mathematically resistant can follow the proof that there can only be 17. If I were a more social type, I'd rush out to invite 16 other composers to join me in composing a set of 17 pieces, each one based upon one of the 17 wallpaper patterns. The patterns can be usefully extended through the choice of colors, something which immediately suggests a variety of scoring patterns in a musical translation. I don't know if they'd be better served by a vocal ensemble or by Morton Feldman's ensemble of flute/percussion/piano (with doublings). In any case, the title would have to be Why 17 Patterns? After some urging from a colleague, I managed to watch a handful of episodes/songs from R Kelly's "hip-hopera", Trapped in the Closet. While I appreciate the attempt to expand the scale of narrative in a pop music genre and think that the linear style of the songs has something going for them, I couldn't help but keep thinking about Robert Ashley's opera for television, Perfect Lives (1978-80), a work at the center of my musical youth, and one that is in every dimension -- narrative, use of language, range of vocal production, use of meta-pop music and meta-mass television, audio mixing, visual quality, even video grain -- prescient of later developments, R. Kelly included. But I don't want this to be an "Ashley did it first and did it best" remark. There are definitely elements of a rather complex feedback loop here at play: the Ashley-co-founded Cooperative Studio for Electronic Music in Ann Arbor and the Motown recording studios were contemporary enterprises and both studios were swimming in a common pool of ideas about the potential of studio production techniques for shaping musical and, ultimately, music-dramatical works. While I have no idea whether one artist was paying any attention to the other, the ideas were in the air and there are definite continuities from Berry Gordy Jr.'s anthems to Ashley's Wolfman, and from Perfect Lives to Trapped in the Closet, a work in a genre which is not shy about its Motown debts. In particular, both share an emphasis on textures flexibly contrasting solo and ensemble vocals which often suggested an extreme of fluidity in the identity of the voices heard. On one hand this is reflected in the range of vocal production, from plain speech to rhythmic speech, to pitch-accented plain speech, to Sprechgesang, all the way to real song with ornaments and melismas. But also this: narrators turn into participants, dialogue turns into interior monologue, personalities split or integrate, and the narrative itself is subjected to all the editing possibilities (chop/fade/cut/blend/merge etc.) used in the TV studio. So, okay, I like Perfect Lives better than Trapped in the Closet. Maybe because I'm too old for the latter, maybe because I prefer midwestern bank robbery and lounge act stories (even metaphorical bank robberies) to urban soap opera and crime stories, but I think it's mostly because Ashley's control over form is masterly, and he manages to do all six episodes of his opera without ever launching into a proper aria or set piece. R. Kelly' piece is, on the other hand, all aria, all songs, and ultimately, just a bit unmodern for it. But should I expect anything else? Kelly is a singer, after all, and Ashley is, quite possibly, the world's greatest talker. Follow up: The ever-provocative Patrick Swanson has a response here; obviously, I stopped watching a bit too soon. The Javanese composer, musician, and teacher KPH Notoprojo, who previously carried the title and name KRT Wasitodiningrat and was most familiar to his students as Pak Cokro, has died at the age of 103 (by western reckoning, and over 120 according to the Javanese calendar). He was an extraordinary figure in the history of 20th century music whose impact and reputation extended far beyond Indonesia. Pak Cokro, the natural son of Prince Paku Alam VII and half-brother of Paku Alam VIII, was music director for many years at the Pura Paku Alam, the palace of the lesser principality in Jogyakarta, Central Java, a position inherited from his adoptive father (making Pak Cokro one of the last of the world's great court musicians). He was also gamelan director at the radio station RRI Yogyakarta and had a lasting impact on many Americans through his teaching activities on the West Coast (his first international experience was a tour of the Soviet Union as a young man). He once described Lou Harrison as his best friend in America, and Harrison in turn readily identified Pak Cokro as his best teacher, an astonishing compliment considering that Harrison studied with both Cowell and Schoenberg. As a musician, Pak Cokro was a central figure in the development of the contemporary style of the Paku Alam Palace which, although maintaining some unique traditional elements, was increasingly marked by influences from the more refined style of the courts in the rival capital city of Surakarta. Although a master instrumentalist, I believe that Pak Cokro considered his most important work to have been that with vocalists, and we are fortunate to have had his students collect his vocal notation as well as to record performances -- via multi-tracking -- of a set of pathetan, "mood" songs in each of the Javanese tonalities. As a composer, his role was always that of a functionary, whether for the court, the new independent Republic of Indonesia, or the radio station. Although born into the typical courtly mix of Agama Jawa and Islam, he was a practitioner of Yoga and a confessed Buddhist and it was entirely unsurprising to discover a work of Pak Cokro's in the Javanese language Roman Catholic liturgical song book. His own compositions not only integrated the styles of the two Javanese capitals, but also experimented with techniques borrowed from Balinese music, and even part-singing, suggesting a nod to the west. Here is a video of Pak Cokro playing gender in 2005. Yes, It's once again time to play Name the Next New Music Box Cover Person. Each month -- as you know too well -- New Music in a Box, the internet organ of the American Music Cartel Center features a video interview with a new music personality (and sometimes a small pride of them). My guesses have had a bad track record; my wishes are even further off. Of late, there have been a conductor, members of a new music ensemble, two composers (one junior, one senior), an avantgardish rock duo and a partridge in a pear tree. Last month, I predicted that the next interviewee would be a critic; suggesting our senior active critic, Alan Rich (someone, do a serious video interview with Rich now!) and was wrong, wrong, (picnic, lightning) wrong. Someone else came closer in guessing Billy Joel. For Mr. September, I've got to go with John Mackey, a composer specializing in wind ensembles, high-cholesterol eating, and making deeply disturbing photos of mutant life forms (warning: this photo is truly disturbing). What's your best guess? No NMB employees, pets, or family members allowed. As always, the winner gets a gift certificate for a Buñueloni at the Cedar Tavern, should it ever reopen. And over at Sound & Fury, the sometimes sound and always furious ACD notes a recent opinion from musicological forensics. Beethoven is said to have died prematurely, due to lead poisoning caused by the malpractice of his own physician. This, of course, connects to a favorite theme of my own, the misplaced teleological approach to the later works of composers. Had he lived longer, Beethoven would surely have produced another couple of symphonies (if not more -- increased fluency in late life is not unknown), so discourse about the finality of the Nachlass is fundamentally mistaken. In music, there is often no simple reduction to the quantitative and there are certainly no easy definitions of either the complex or the simple. When the radical music turned towards the use of minimal materials, the goal and result of that turn was often anything other than simple. By clarifying one or more aspects of the material environment of music, circumstances could be achieved for for a more in-depth perception of the musical experience. Christian Wolff's astonishing Trio I (dated January, 1951, the composer was not yet 17!). At first glance, just four pitches: g, a', ab'', c'', but at first listen, much more: a', ab'' & c''' plus rests on the flute, any of the pitches, plus rests , on trumpet, the three lower pitches, plus rests, played ordinario or as harmonics on 'cello, plus combinations of the above, plus dynamic variations. Consider also the instability in the surface identity of the music: is this predominantly harmonic or melodic? Or is that even a meaningful distinction here? (This piece is prescient in other ways as well. The -- presumably Webern-inspired -- symmetries of its construction anticipate later works by Morton Feldman). 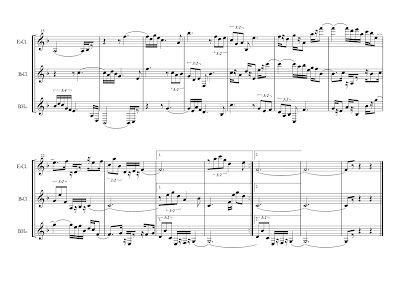 As a composer, this little piece demonstrates the clear advantage of a restricted gamut over music which consumes the total chromatic, dynamic range, instrumental ensemble etc.. Details are here framed, made audible, and cherished, while more indiscriminate consumption is ultimately about making details subsidiary to the ensemble. The sustained wind tones are heard individually and together -- perhaps initially as an octave expanded minor sixth, but eventually as something both more distinct and more anonymous. And how is that lower register minor third in the piano heard? In that register, its identity as an interval takes time to resolve from an initially noisy appearance, and the composer has given us enough time to experience that resolution. What appear to be complex flurries of notes turn out to be unisons colored by their instrumentation, with something close to a tune frequently emerging from nothing more or less than a major second gently rocking back and forth. One of the qualities I most value in the radical music tradition is its loss of certainty (even ambiguity) about a surface and depth distinction. 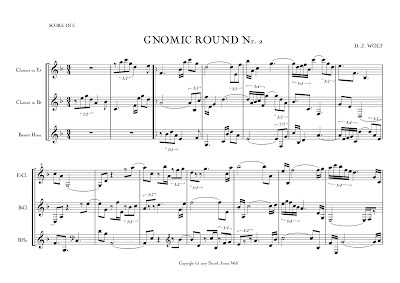 While Milton Babbitt could ramble on with great certainty about his "sonic surfaces", meaning nothing other than the notes on the page, what, precisely, is the surface in The Well-Tuned Piano or Drumming or Navigations for Strings? Is it the notes on the page or those physically struck on the instruments, or is it the the sounds produced directly by those actions, or is it the cloud of combination and resultant tones and interference patterns and acoustical beating? In many cases, this uncertainty or ambiguity goes even further, with distinctions between musical, psychoacoustical, and physical parameters constantly in play. When slow motion playing creates rapid interference beating via subtle pitch or rhythmic differences, where exactly does one locate tempo? In Central Javanese Karawitan or in some of the Studies of Nancarrow, there is fluid motion in a field of relationships between pitch, timbre, rhythm, and tempo. The radical music, by simple virtue of its turn to the most radical (root, or base) elements of music and of sound, often fundamentally shakes our understanding of those elements. Borrowing a bit from linguistics, there are basically two ways of creating novelty: the first is to create new, never-before-uttered expressions that are, nevertheless, entirely competent expressions within the received language, its lexicon, and its rules; the second is to create expressions which are, under the terms of of the received language, non-competent, if not impossible. The choice is between saying something which simply has not been said and heard before and saying something which was heretofore impossible to say or hear. The histories of repertoire in music, art, poetry, etc. are marked by a certain oscillation between the two. Do not instrumentalize music for torture. The M-dialing musicologists have an excellent thread on the misuse of music for torture. The Society for Ethnomusicology has taken a formal position in opposition to this misuse. I believe that the SEM did not go far enough and condemn torture altogether, but it is still a bit shocking that none of the other music-scholarly societies have yet followed suit. Suzanne Cusick details the issue, here. I would add the appendix to Slonimsky's Music Since 1900 which documents earlier US government-sponsored research into the use of specific sounds with damaging physiological effects for military and police applications and note that the instrumentalization of music in psychological mechanisms -- trance and torture are examples -- does not rely on any qualities specific to a particular music other than the most broadly identifiable (repetition and amplitude, for example) and that when music is used in such a mechanism, it has a place-holding function and can be replaced by another music or even no music at all. Moreover, when a particular music has been misused for a mechanism intended to change behavior, then the music may acquire a permanent mechanical association with the behavior. Therefore the use of music in such mechanisms constitutes a fundamental devaluation of the music used. I trust that I need not comment on the implications of a cultural economy in which works of arts can be so devalued. Sometime in the late 20th century, attaching a thick -- if not complete -- external apparatus (contextual, intellectual, explanatory, and tangential commentary and footnotes for musical notes) to a piece of music became an acceptable standard of practice. Now, this has always been a possible practice -- Wagner wrote extensively and Ives essayed before his Concord Sonata, and somehow the fact that Beethoven read Kant is supposed to mean that reading Kant is a useful adjunct to knowing the music, and for some historical musical cultures, the music came solidly embedded in larger systems (e.g. the tropes of liturgical music, or baroque systems of figure and affect) but recently, among a certain class in Newmusicland, this apparatus has become an emblem of rigor and sophistication, sometimes even a prerequisite to approval among those who identify themselves as rigorous and/or sophisticated. Sometimes this apparatus is in the form of a more-or-less practical music theory (often the natural byproduct of a day job teaching musical theory and practice), sometimes the theory acquires a more mathematical polish, sometimes its more literary, philosophical, or culturally contextual. At its best, it's a thickening of the musical experience with complementary intellectual, aesthetic, and emotional experiences, travel guides for perplexed and perplex-able listeners, all done in a playful spirit. I think the keys to this are tone, balance and utility. The apparatus attached to a work of music should enhance it, not overweigh it in either volume or density or ambition, and be careful to contribute to the spirit of the musical enterprise, whether that of the individual work or of music-making in general. But then again, we should leave open the possibility of a work in which the ostensible apparatus is essential, creating a synthetic genre or even an entirely new medium, going outside of the traditional enterprise of music-making. I like the example of Nabokov's Pale Fire, a novel ostensibly in the form of a scholarly edition of a poem, and composed of a Forward, the poem itself, the editor's Commentary, and the Index (Nabokov's translation of Eugene Onegin, composed at roughly the same time, has precisely the same form). The novel comes without instructions about how it should be read, but instead invites reading in a number of ways, some of them leading to contradictory constructions of the narrative (or, more correctly, narratives). Here is a model of an artwork in which parallel worlds (poetry, scholarship, auto/biography, fiction) leak into one another and create a work which ambitiously and playfully enjoys the best features of each of these worlds. It's fascinating to imagine a musical (or musical + media X, Y, Z-ial) equivalent. Arrostire due beccacce e disossarle tenendo la carne da parte. Pestare le ossa in un mortaio, farne un purè da diluire nel brodo. Passare al setaccio, unire la carne tritata, sale, pepe, un cucchiaio di cognac. Aggiungere del brodo e servire con dei crostini o con grossi grissini torinesi. Here are the solutions to my composers-in-the-kitchen quiz. Charles Shere did best, with two correct answers, which means that the prize (now standing at $2.83) will not be awarded but will be rolled over into the kitty for the next competition. During the 1985 New Music America Festival in Los Angeles, the official hotel was the Park Plaza, a seedy art deco Imitat hunk from 1925 on the northern side of MacArthur Park. For two weeks, Newmusicland-famous names and faces were passing through the hotel's once-almost-grand lobby and staircase. At the same time, cast and crew for an episode of the TV series Murder, She Wrote were busy in the same space filming an episode. And no matter how much fun it was to cross paths with Morton Feldman or Joan La Barbara, not a few festival guests could be heard gushing a bit about maybe, just maybe, getting caught by a camera in the same frame as Angela Lansbury or the episode's guest murderer, Robert Culp. (If my research is correct, this was Season 2, Episode 12, "Murder by Appointment Only", first broadcast on January 5th, 1986. Anyone with access to a recording of this episode might want to check it out for possible cameo appearances by genuine new music celebrities of the mid-80s). I did ask John Cage once if there was a film star he'd like to meet. He answered "Greta Garbo". I don't know if this says anything much about Cage's taste in films or indicates a very interesting distance to contemporary popular culture, but I do remember that a performance of Cunningham's solo dance Tango, accompanied by Cage's delightful pieces Message to Eric Satie with Sound Anonymously Received, was accompanied in at least one performance (at UC Berkeley) by a live snippet of a Barney Miller episode on an onstage TV. Tango/Message still strikes me as an intensely intimate piece, a public glimpse at some private matters between the dancer and the musician. As for me, although I grew up in Southern California, and once went trick-or-treating at Liberace's house in Palm Springs (the cheapskate didn't answer the door), my contacts with that world were limited. My brother does say, however, that one of our uncles met Merv Griffin once. It must be in the nature of music that just as you think you've got it under control, it slips away, like a handful of sand, an experience shared by composers, performers, and listeners alike. Some audio tapes, some thirty years old, had been in storage in my bank safe deposit box. Or at least I thought they were safe. Finally getting 'round to making some digital copies, I soon discovered that a number of them were irretrievably lost: athough stored carefully, ends out, the tapes were sometimes stuck together, sounds had often bled across tracks or turns of the reel, and some tape, upon being played for the first time in years, stretched beyond tolerance. (Ironically, one of the lost pieces was a copy of the tape for a theatre piece by a friend, entitled appropriately, Decay). I once lost a manuscript left in a windowsill to a surprise rainfall; that was poetic, this was just trouble with technology. Time now to assess the damages, do what I can to recover some pieces, and reconcile myself to a few pieces lost for good. And this temptation: to try to recreate, with present resources, some of the lost pieces. The most famous ruin on Crete is that of the palace at Knossos. Patially reconstructed in the early part of the 20th century by Arthur Evans, it is a splendid fantasy on the basis of very little data, with an arcade here and a room there making physical Evans' best guess about what might have been. (We know precious little about this culture -- not even what the builders of the city/palace/temple/whatever-it-was would have called themselves; "Minoan" is an Evans neologism). Such reconstructions are now artifacts of an earlier age in archaeology, and have long been subject to heavy critique in the profession, which now prefers more careful study of sites, often reburying them, with the intention of leaving them better preserved for future examination with more gentle techniques. But while there is something old-fashioned about the ethic of Evans' enterprise, it is also totally compelling, a slice of early 20th century imagination, based on both the contemporary state of scholarship and a contemporary aesthetic. If there's any fault to be found with this, I think, it's that Evans didn't go far enough in his reconstruction. ASFAIC, Evans should have rebuilt the whole damn thing, as palace, temple, labyrinth, pleasure garden, or whatever it was, going consequently wherever his intuitions led. Every once in a while, I think that it's both interesting and valuable to take the risk of a best guess like this, not only to reconstruct a distant past but also, by doing so, to capture a vital component of the spirit of the present moment. In the summer of 1984, having finished my first year of graduate school and completed a draft of a thesis on the music of Nancarrow, I went to central Mexico with the intention of meeting the composer (I had already met him twice briefly in the US, at New Music America in SF and at the Cabrillo Festival in Aptos, where I played Space Invaders with his young son on the machine at Manuel's). But I was also tempted -- having been around the world music program at Wesleyan for a year -- by the prospect of something, at least vaguely, ethnomusicological. By a set of accidents I won't get into here I met a wonderful American ex-pat journalist, May Brooks, like Nancarrow, an exile from the McCarthyite era* then engaged in some important writing projects involving Mexican history and literature, and especially the role of women and indigenous groups. She also happened to be an old friend of Nancarrow's and, although they were, at the moment, not on speaking terms, she agreed to find out if Nancarrow was visitable. A few days later, May, like Nancarrow, a heavy smoker (from cartons smuggled in by all members of her circle of friends and relations), pointed to the tip of her cigarette, and simply said that it wasn't a good idea at the moment, with the implication that his health was poor. Faced with a practical and an ethical problem, I spent the rest of my summer learning Nahuatl, and never returned to the Nancarrow manuscript. A few years later, in preparation for a dissertation, I drew up a draft of a book about the music of La Monte Young. La Monte left me with a practical problem, and La Monte's parents left me with an ethical problem. La Monte did not want me to include any musical examples in the text, and was especially insistent that I not include the pitches used in his pieces composed in just intonation. In most cases, for example, that of The Well-Tuned Piano, the pitches used (of not the complete tuning, for one pitch on the keyboard was not then in use in his performances) could be determined by ear, but La Monte insisted on the secrecy and I came to agree with him, recognizing that the details of pieces which he did not allow to be performed without his own participation were the working capital of his livelihood, and were something very different from scores written for eventual performance by other musicians. I came up with some ways of writing about the pitches in the works from first principles and without being totally explicit, but was never satisfied with this, and, in the absence of musical examples, my scholarship would be faced with serious, possibly fatal, questions about its documentation. * For anyone interested in the community of US political exiles in Mexico, Diana Anhalt's book, A Gathering of Fugitives, is well worth reading, and it's online here. ** The decisions and opinions of composers -- especially when they become jurors or otherwise participate in handing out scholarships, awards, prizes, positions, or commissions -- can, in fact, have consequences. Although these consequences are of a different scale than the consequences of a political decision, they are real and can affect the lives and livelihoods of individuals in a serious way. I hope that we, as a community of musicians, are conscientious in speaking up about possible conflicts of interest or instances of corruption in the distribution of the small spoils available to us. In any case, the biography of Nancarrow, a composer who did not participate in any such power arrangements, bears no relationship to such problems. ***A young musicologist, Jeremy Grimshaw, who is a member of the LDS church, has recently written in some detail about this aspect of Young's music. Colin Holter, at the New Music Sushi Box, has a nice post about taking instruments beyond their design spec, paraphrasing a pop musician who spoke of a "capacity for being messed with." He asks, in particular, about the harpsichord, and instrument which, at first audition, seems to be restricted to exploration in only one parameter, pitch, but not only is that parameter rich (e.g. via retuning or retempering, whether historical or novel) but it turns out that the harpsichord's speed, agility, incisive and rapid-fire attack can lead to tremendous -- if sometime subtle -- invention in the domains of time and timbre, indeed (take Ligeti's Continuum as an example) even reducing pitch to a spare wheel. Holter is onto the one big idea about orchestration, and that is that innovation in orchestration always requires going beyond design specifications and received cultural associations. The first composer to invite horns from the hunting party or trumpets and drums from the military or a trombone choir from the church tower acted transgressively, both musically and socially. The very act of integrating members of rigidly separate guilds into a single performing force must have been a bit of staggeringly diplomatic labor negotiations. And imagine the shocking effect of the first time an audience encountered such a juxtaposition: what are those hunters doing in the orchestra? And this transgression is present at the smallest possible level of orchestration: which note (and which register, timing, dynamic, articulation) to which instrument, and in the combination of instruments. Orchestration books tend less to be theory than to be lists, catalogues, recipes; time-tested recommendations about what sounds good, effective. The musical equivalent of an etiquette book: how to be well behaved. But great music is never well-behaved -- except, of course, when making fun of the well-behaved -- and great composers are always discovering the transgressive potential of their materials. (Quote me on this: Great composers are always rediscovering the rawness of their materials). At the same time, and particularly in the domain of timbre, a composer has to be somewhat economical with her or his inventions, as ear fatigue, preciousness, and even a certain amount of fetishing are real risks. But your mileage may vary: I will never tire of the opening Basson solo in Le Sacre in its forbiddenly high register, or the gurgling conch shells in Inlets, but for me the preciousness of the effects in Vox Balaenae didn't last longer than the month of July 1977. A pop quiz for an idle August day. Name the composer who has either cooked or been responsible for the recipe of each of the following. Some answers can be located online, others are more obscure. "The Danish government today expressed its regret over the Viking invasion of Ireland more than 1,000 years ago." 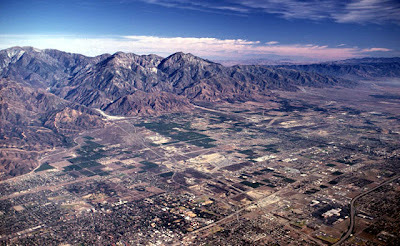 The San Gabriel mountains, viewed from the Pomona Valley. Mt. San Antonio (aka Mt. Baldy, or Old Baldy) is the highest peak to the left. Jeez. Gone two weeks only to discover that half of New York has been arguing over minimalism. Again. And proving that New York is the most parochial place on earth. Again. But it is nevertheless amusing to read a younger colleague describe three works of 1981 (Tehillim, the score to Koyaanisqatsi, and Harmonium) as "Minimalism 2.0". By my -- admittedly aged, if not yet senescent -- reckoning, these three pieces are at least Minimalism Mach 5 (following the initial phases of long tone music, music based on acoustic phenomena, pattern/phase/systems musics, and finally various reconciliations with tonality or modality that followed a trajectory from the west coast of the US all around the globe), and, more critically, these are three pieces in which the respective composers might each be described as having decisively stepped off the minimal trolley. I had a major insight, some years back, about the differences in viewpoints between generations. At a symposium here in Frankfurt for younger composers run by Ensemble Modern and MusikTexte, two senior figures -- Rzewski and Spahlinger, by name -- tried to give the youngsters some wisen'd counsel, and, in what is here identified as the "spirit of 1968", barely disguised their disappointment in the lack of revolutionary fervor among the young. Spahlinger even insisted to the assembled semi-masses that composing was nothing other than to "Struggle, Struggle, Struggle". My good friend Hauke Harder, one of the most radical composers I knew, both musically and politically, just held his tongue, hoping to get on with the rehearsals, but another composer, a student of Wilhelm Killmayer of all people -- that is to say someone with the most traditional possible training and background, a real "professional" -- stood up and told Spahlinger as clearly as possible, that those conflicts were over, that there was more serious business at hand. I immediately recalled a famous story from Darmstadt. David Tudor had performed a piece in a seminar, and a kibitzing Theodor W. Adorno interrupted the proceeding to launch into a small but throughly (and authentically) adorno-esque lecture. Tudor responded, calmly but firm: "You do not understand this music." As much as I can cheer on the delicious take-down here, of Adorno, or of Spahlinger, I also have to recognize that what is going on is simply that which has inevitably got to go on between generations: reconsiderations, reinterpretations, misunderstandings. In an essay for the 100th issue of MusikKonzepte, with the theme of "What is Progress? ", I wrote, provocatively perhaps, but honestly, that "progress is forgetting". The cards get shuffled again and we play another round, same rules (same ears), just as interesting as the last, but plays out completely different. And here I make my plea for a longer memory: when we look, or rather: listen, back to this experimental, radical, and minimal repertoire, let's try to recover more rather than less, and renew our acquaintance with music other than that that has come to carry official sanction. There were and are other important pieces and composers on the west coast whose work did not reach or has not reached the east, there were and are other significant strains of music in a similar spirit in New York that have not had the profile of the nonesuch gang, and the reach of this impulse outside of the United States should not be underestimated. I don't travel much, and even less to tourist-y places, but enough to have become struck by some flattening aspects of mass travel culture. Palm frond-covered verandas are a near universal, whether palms are native plants or not. Souvenirs are increasingly indistinguishable from one place to the next -- the same bamboo toy spinning-top is sold in the village of Bali on Crete and on Bali in Indonesia. Probably produced somewhere in West Africa from Phillipino raw materials. I even wonder if there isn't a closed economy of recycled souvenir objects: that wooden bust of Ben Franklin your uncle bought in Philadelphia in '52 has long been charred, re-carved, stained, and feathered as a fake Maconde warrier. Worst of all is travel reading. I have never learned the lesson of bringing enough books with me to read, and end up, sure enough, in some shop with half-a-shelf of trashy novels and the handful of officially sanctioned tourist guides to the local monuments and ruins, translated into an English idiom I barely understand even when the editing is reasonable. But there has been a recent conflagration of these two literary genres, in that travel novels have been less dominated by the Harold Robbins/Jackie Collins and John Grisham schools, and increasingly dominated by the post-Dan Brown apocalyptic/ancient conspiracy genre, placing non-fictions books on the same half-shelf with a few speculative archaeological tracts -- books by retired professors from here or there writing in a field outside of their professional specializations books which could not get published by their local university press, but do get published by the national archaeological press in tourists editions in editions with photos rendered in the style of a 1962 issue of Soviet Life. We now learn about the Mayan invention of television and the Knossan discovery of cutlery, all part of the massive conspiracy behind our present troubles. Great stuff for idle reading, but time to get back to composing. One week in Crete. Overwhelmed by the sea, the mountains (so much like Californian, with stretches like Baja, and others like the central coast, but then again so much not like California), surrounded by Olive and Carob trees. And then this -- all day is accompanied by cicadas, as loud as I've ever heard them, and night arrives with the more subdued sounds of crickets. When I arrived, the drumming of the cicadas (and they are drummers, not fiddlers) was a shock, I thought I'd never be able to hear a musical sound, but then, after a day, it simply became background radiation. Are my ears better or worse for the wear? Or have those cicada thumbs entered some lower level of musical consciousness. In any case, I'm better off here among the cicadas, then among the spiders in Germany. No biography of Bach ever begins with a mention of spiders, no history of Crete ever mentions the cicadas. A mistake, methinks.